The Menu item is missing?!?! 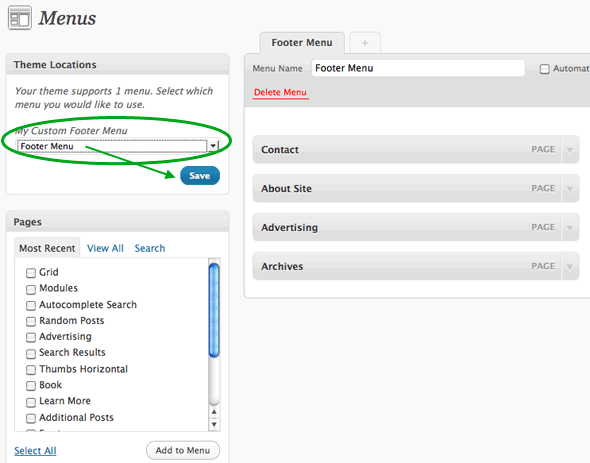 Below we'll go through the steps for inserting a custom menu into your theme. Note that many themes will have menu functionality built-in. This is for Do-It-Yourself folks who are trying to add it to their existing theme. Now that the menu feature is enabled, go to Appearance ▸ Menus and build and save a custom menu. Now that you've declared a menu (in functions.php) and built a menu (in the admin), you'll need to connect them to each other. 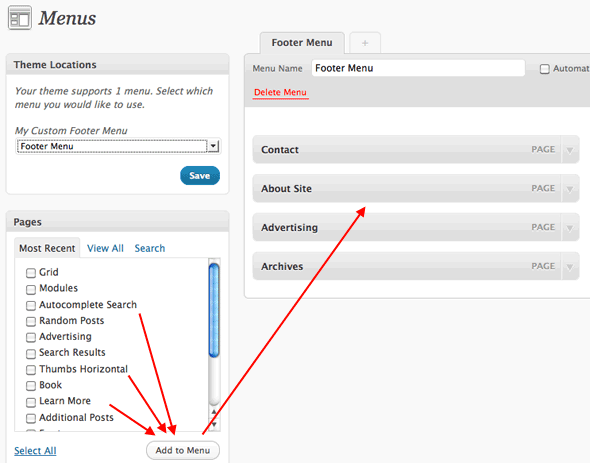 Now any time this menu needs to be updated, we can do it from the comfort of the WordPress admin area. Ahhh has been a long day :) Good to know your watching! I had to learn this the hard way, I wish I had seen this post first. Rockin-n-rolling! I can’t wait for DIW 3.0+ later this month… I take it this is an excerpt? Loving it. Will totally use this on my new site =]. Thanks Chris. PS. Love the book. The menu creation was a necessary step for WP but what’s a HUGE lack with custom post types is, that you can only attach a specific post of a post type, not the actual post type (as it’s possible with categories), which is not only sad but seems completely illogical to me, since a custom post type is a pimped category … isn’t it? And why would I i.e. attach a movie (of post type movies) to a menu, rather than the movies post type/category? Does anybody know a way other than creating a page, with a custom loop for the targeted post type? Is that even the right place to discuss this? One thing that it badly lacks is the to define settings, like show 3 depth of this category and exclude this and this. For that I find myself still hacking around this within themes. And, always remember to click save after you changed something. I did this mistake because of the Ajaxy interface. It will not save automatically. You make it sound sooo easy! before calling wp_nav_menu in step 4 above. Of course for a publicly released theme, you probably want to include a fall back menu. At the risk of spamming you, if people are interested in providing robust menus that work for all versions (using Custom Menus for 3.0 and wp_list_pages for earlier versions)), they can read my Practical Theme Support for Menus post. Umm, drop that closing pre tag – that was HTML that wasn’t supposed to appear in my comment. Change the name of the menu in the code above to match whatever you named the menu in the admin. Don’t you mean the name you gave it in the functions.php ? Nope, I mean the name you gave it in the admin. That’s how the function knows exactly which menu to put there. The functions.php name just “declares” it, but the menu in the admin is where you attach a real menu to it and that’s the name you need. I must be missing something because I just don’t understand why everyone is so excited about the new wp menus. It seems like a lot of work to essentially create a bunch of links within a list structure. What’s the benefit of doing it this way opposed to simply coding a menu? For my own site, there’s no real advantage as I’m happy to code the menu manually. But if you are writing a theme that other people will use, that makes it much easier for the end user. Note also, that the vast majority of the 10 million people using WordPress are not web developers, so they are probably much more comfortable using a menu interface compared to manually coding a menu. It’s just a matter of being able to update menus without touching code. Obviously, better for non-coders. But better for us coders too, especially when you are building gigantic/complex menus that can really benefit from a UI to control position of things and whatnot. Does anyone know how to add a “home” link t0 these menus? I know i can add the whole link to the homepage as a custom link, but it doesnt get the current page class if i do that…. or does it? In the area where you choose pages to include, choose the tab View all. Now the choice Home is available. does anyone know how to duplicate the main menu in the footer? ie.. if you create one menu it shows in both the main nav area and in the footer. The code currently outputs div id, so I do want to duplicate the div id. I don’t want to be creating 2 menus just using the one in 2 places. Unfortunately, it seems when JAWS and Window-Eyes encounter “display:none” they simply ignore the content. Switching the state to “display:block” via CSS on hover does not populate the content in the sreenreader later so the contents of the Twenty Ten dropdown menus are basically invisible and unreachable. Not a good situation. I tried positioning the menus off-screen instead of hiding them but this broke the functionality on iPhone and iPad. This is just a quick finding. I intend to look into the issue a bit more and do a writeup. If you have screenreader experience, I would like to hear your thoughts on how we can fix this and get the needed updates into WordPress. Do you know how visibility: hidden bodes with screenreaders? Since these menus are positioned to not effect other elements layout-wise anyway, maybe that would work. Visibility:hidden and display:none are basically the same — both ignored by JAWS and Window-Eyes. Switching to off-screen absolute positioning solves the screenreader issue but breaks iPhone and iPad functionality. Not sure if it’s an intended feature, but one of the neat things about the dropdowns implemented in Twenty Ten is that they actually work on iPhone and iPad. Tapping on a top level menu item displays and holds a submenu in open position allowing iPhone/iPad users to navigate submenu items. When I tried switching the submenus from display:none to use CSS off-screen absolute positioning it fixed the screen reader issue but broke iPhone/iPad functionality (tapping a top level menu simply launched the page). Given all Twenty Ten sites using dropdowns with display:none are basically inaccessible to screen readers, thinking display:none should be updated in core to off-screen positioning. To restore iPhone/iPad functionality, maybe serve a special stylesheet that uses display:none? Of course, that’s heading down the road of device detection which gets messy. What do you think? Maybe there’s a better solution? Is the case the using the position absolute method breaks the iPhone/iPad in this exact particular instance of how the CSS was written, or is that technique in general just always break the iPhone/iPad? Good question. I don’t have a quick answer. It’s on my to-do list to investigate. Seems like common functionality, but I can’t for the life of me figure it out. I know you can add a specific class to the li items, but what about the link itself? The a tag? I want to be able to add a class to that from within the custom menu so I can use a menu item to launch a thickbox pop-up. As usual a complete guide to whatever topic you cover, thank you for making it so easy to follow and implement by anyone. I had done a quick video screen cast on using the New Custom Menus in WP 3.0 here. Hope it’s useful as well. There’s an issue with how you’re displaying the menu. As is, it requires an end user to know what you’re referencing the menu as, and naming their custom menu just that. So if they named their new menu ‘foo’ and put that in the drop down for the ‘Footer Menu’ slot under ‘Theme Locations’ it wouldn’t work. It’s pretty confusing. that way no matter what they name their custom menu, they can just put it in the correct slot and it will work. When building your menu within the admin, you can add URL, Navigation Label, and Title Attribute to each menu item. Is there any way of adding a class or ID to specific menu items? Also, is there any way of adding any additional code into the menu? ie. – the last menu item is search, but rather than making ‘search’ a link, have a search box after it instead. here’s the site I’m working on, and the jquery menu is in place – roughly – and I’ve been pullin’ my thin hair out trying to figure out a way to stick to the designer’s idea. here. Also, the Home button won’t work. Weird. Thanks for being there for me over and over again. I’m much obliged. Great article! Quick question. At least with the Twenty Ten template it wants to repeat the navigation menu vertically – how can I force it to repeat horizontally instead? I’ve placed it in the footer section of code…but its getting squished over vertically instead of spreading out nice horizontally. Can see what I mean on cccpenndel.org. Thanks! Does anyone have an idea on how to separate the children from parents to place them elsewhere on the page? A split menu so to say. The internet is full of how to use the new wp_nav_menu but little about modifying it. +1 on this one! I cannot find anything regarding splitting the menu in the sidebar. Here’s the test site – click on the about page. I struggled with the same thing, and realized that it wasn’t 2nd rate to put the menus in the page templates. it’s fine. When I’m in one of the children pages of the page Checklist, the tab Resources isn’t turned on. Those children aren’t part of the menu though. I too haven’t found a way to include “home” in the menu. Anyone knows? In the area where you choose pages to include, chose the tab View all. Now the choice Home is available. @Marc – thanks for the links! I tried the simple section navigation but it doesn’t seem to order SubPages in the order that the actual custom menu is in. I’d like to stay away from plugins (if possible) and find the best way to code it. I agree, but after I couldn’t find any code snippets or explanation for this problem I decided to go with the plugin. Would you let me know if you find something? Absolutely – I’ve asked this question in on quite a few places and will report back ASAP. How do I display a custom top/primary menu for a custom page template? Every other page/post/home on the site has the standard site menu at top of page, but for the custom page menu I want just a single “Home” menu up there. I created a custom “Home_solo” menu but can’t assign it to the top/primary nav or it shows on all pages/posts. I’ve tried various ways of calling it in my custom page template to no avail, but am a newbie so I might be missing something obvious (am using a twenty eleven child with WP3.4). Any tips or suggested reading appreciated. Thanks for a great post (and book). Moments ago found a solution via WP forums where someone used Custom Fields for their custom page menu problems; something I hadn’t even considered. Thanks again for a great article!